Randall Grahm (above) needs no introduction from me. He’s one of the greatest authors, grape growers, and winemakers of our generation and he’s also one of the most lovely and fascinating personages I’ve ever had the opportunity to know. His erudition, humanity, and love of paronomasia are models for my own writing and I was thrilled that he agreed to do the following interview with me. Randall will be pouring and talking about his wines at Sotto in Los Angeles (where I co-author the wine list) on Thursday, November 7 (6:30-7:30 p.m. and then talking tableside during the first dinner seating). Registration is not yet online but you can snag a seat by emailing events@sottorestaurant.com. 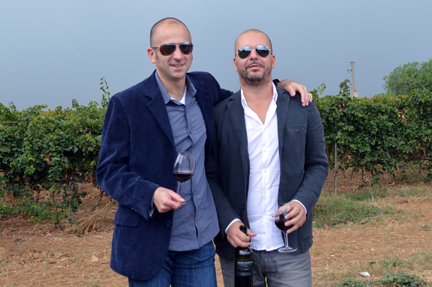 I’ll be speaking at the Cantele tasting at the restaurant tomorrow night with my good friend winemaker Paolo Cantele. There are just a few spots left for our event. 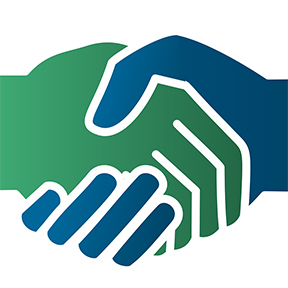 Please click here for registration and info. Can you talk about the blurred line between science and the “mystery” of biodynamics? Will we ever have an explanation of why it works? And what is spirituality’s role in biodynamics in America? What prompted the tweet? You were among the first U.S. winemakers to list all the ingredients of your wines on the label. What feedback have you seen? 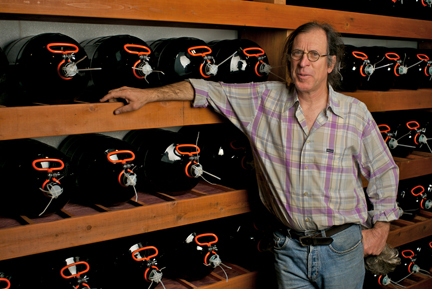 Are other winemakers following your lead? Do you envision a day when all wines will be labeled like this? In my mind, I can already see my adoring wife Tracie P rolling her gorgeous green eyes: yes, even though I’m two nights into an “eat ’til we drop” tour of the U.S. with my buddy and client Paolo Cantele, I just had to have a cheese steak for lunch in Philadelphia. So how’s your pancia doing? she’ll ask me when we speak later today. 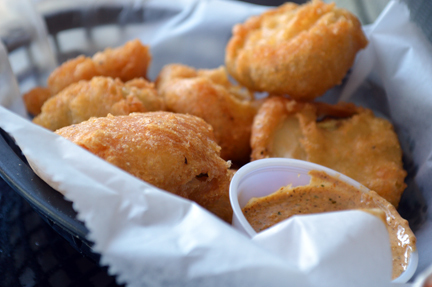 Those are the fried pickles that went along with the cheese steak. I know… I know… With the many epic meals in my near past and future (still working on my post on Vetri, one of the best meals I’ve ever had, period), I shouldn’t be throwing caution to the wind (literally). 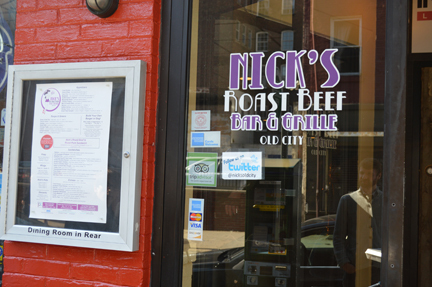 I wish I would have taken a photo of the dude at Nick’s (in the Old City) who served me the sandwich. With his tattoos and 50s ‘do, he was straight out of central casting. 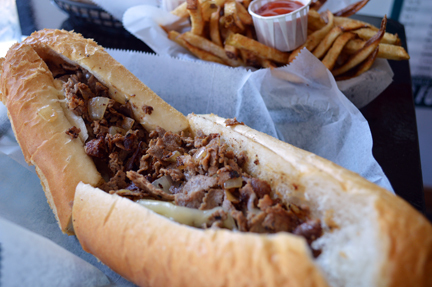 In Philly, they just call it cheese steak. When it came to selecting wines on Monday night at the amazing Marea in New York, my dining companions — an Italian winemaker and one of the top wine writers working in the U.S. today — and I joked about what a tall order it would be. Between the three of us, we surmised, it would be difficult to come up with a wine that none of us had ever tasted. 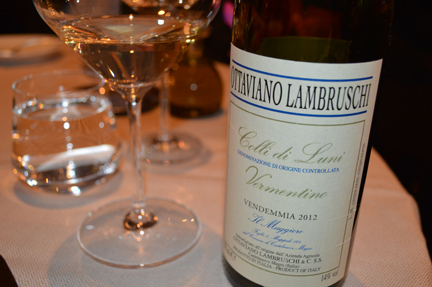 Having been told that we wanted to start with something white with healthy acidity and minerality, sommelier Francesco Grosso, who is one of the leading Italocentric wine professionals in the country right now, delivered the Lambruschi 2012 Vermentino Colli di Luni Il Maggiore from Liguria — a wine that none of us had ever tasted. 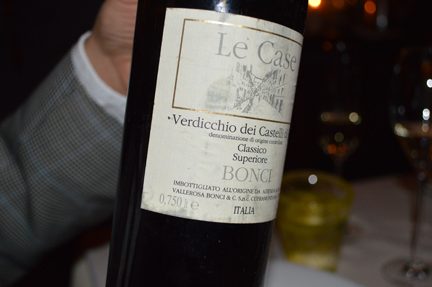 The wine was pure and focused, with that “nervy backbone” that Italian writers look for in wines like this. Thanks to its freshness and brightness, you could tell it had been vinified in stainless-steel but it also had remarkable depth and nuance reminiscent of white wines that are fermented in cask. I’d ascribe its complexity to the materia prima: I don’t know much about the grower but would hazard to guess that the vines are older and that selection massale has played a role in the vineyard’s life, delivering richer clones and richer wines. Chapeau bas, Francesco! I love what you are doing with and for Italian wines. O and what did we eat? I posted the food shots yesterday over on Paolo’s blog. 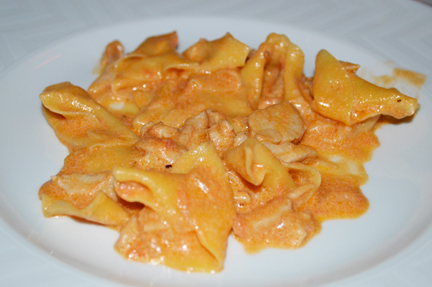 Our “eating ’til we drop” tour of the U.S. continues: Monday we were at Marea, last night at Vetri in Philadelphia (posts forthcoming, an amazing experience), tonight at Tony’s in Houston. 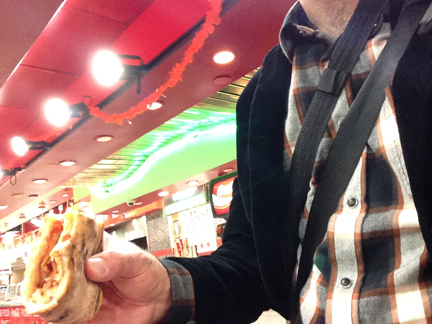 Just had to grab a slice at Rosa Pizza in Penn Station before heading out for Philadelphia. I actually had a plain slice. It was pretty good. 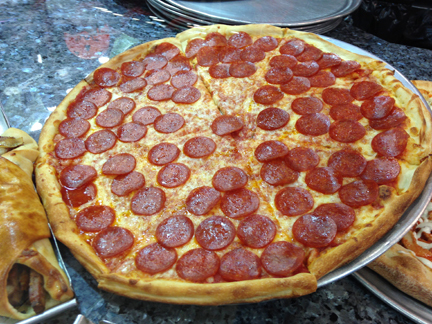 But the pepperoni was so much more photogenic. 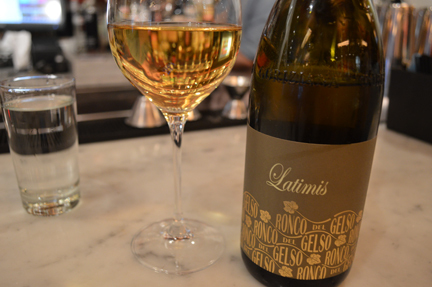 When the server at Il Buco Alimentari e Vineria on Great Jones (in lower Manhattan) brought out the Ronco del Gelso 2010 Latimis (Isonzo del Friuli) by-the-glass last night, I was sure that he had mistakenly brought me one of the winery’s top wines in the place of one of the entry-tier labels. But my good friend Roberto Paris, the restaurant’s general manager and one of my favorite NYC wine professionals, explained that he had bought the wine on a closeout and was able to offer it by the glass. The rich, golden wine — a blend of Friulano, Pinot Bianco, Traminer, and Riesling — was dominated in its aromatic profile by the latter two grapes. An orange wine ante litteram, it was simply stunning in the glass, muscular and confident, “drinking beautifully right now,” as Roberto noted. It’s one of the great things about dining in Manhattan: you never know when you’re going to find a surprise like this by the glass. Il Buco Alimentari e Vineria is the more casual incarnation of the storied Il Buco on Bond, one of my haunts from my years in the city. It was great to catch up with Roberto and reminisce about the years when the Italian wine renaissance began to take shape in NYC. Posting in a hurry this morning as I rush to grab a high-speed train to Philadelphia. 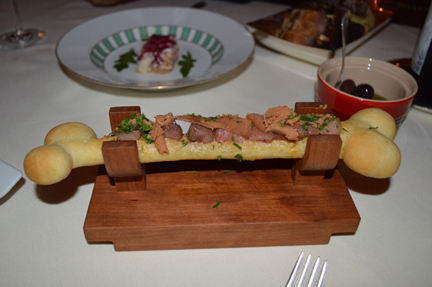 An INCREDIBLE dinner at Marea last night. Will tell all asap… Thanks for reading! 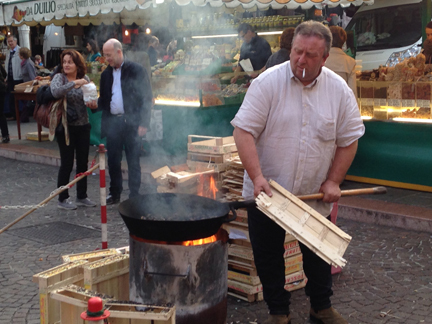 Every year, Steve Muench, my college roommate and one of my best friends of all time (and one of the most brilliant people I’ve ever met) sends me a photo of a roast chestnut seller in the Piazza della Frutta in Padua where he and I attended university back in the late 80s. It’s that time of year when the damp cool weather of fall in the Veneto is tempered by the unmistakable aroma of street-roasted chestnuts. I’m about to leave for New York where my good buddy and client Paolo Cantele (below right) and I will begin our Cantele Rolling Thunder Tour 2013. We have some pretty amazing reservations lined up across the country. Do Bianchi THANKSGIVING SIX-PACK 2013 is LIVE! 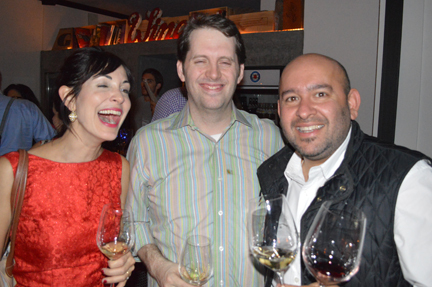 Above, from left: Nicole Burke, Krug’s U.S. brand ambassador, leading Houston sommelier (and my good friend) Sean Beck, and the inimitable Rajat Parr, one of the coolest dudes in the wine world period. No, the image above wasn’t snapped at The Ten Bells in New York or Tosca Café in San Francisco. It was taken two nights ago at my favorite Houston wine bar, Camerata, where one invariably bumps into wine scene glitterati. There’s a genuine buzz (excuse the pun) in Houston these days and so much groovy stuff happening. I’d only ever met Raj on one other occasion and I was so geeked to catch up with him. I’m an unabashed fan and I believe he really stands apart from his peers in his entirely fresh, real, and sui generis approach to wine and wine connoisseurship. He’s just a super cool dude and I was stoked to rub shoulders and taste with him. The Krug wasn’t bad either. 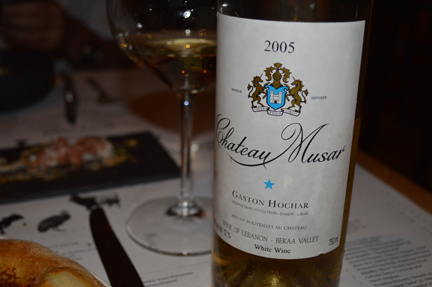 Earlier in the evening, sommelier Travis Hinkle poured me some very reasonably priced 2005 Musar white, a wine I love to taste at every opportunity, over at The Pass and Provisions. 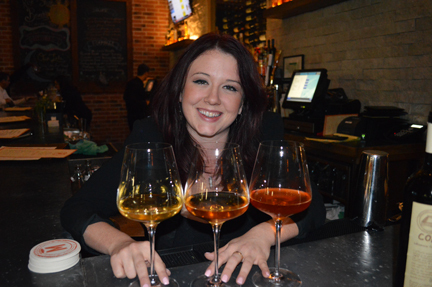 And before the evening got started, I caught up with my favorite Italophile wine director in Houston, Samantha Porter, who’s pouring a flight of macerated whites next week at Osteria Mazzantini. Who can complain about living in Texas? I wish that everyone could know and experience what a wonderful man, caring friend, gastronomic encyclopedia, and downright mensch my good friend and client Tony Vallone is. 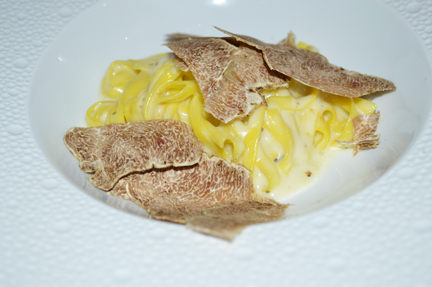 Last night he treated me and a Houston food writer (another one of my best friends in Houston) to our first Alba truffles of the season at his flagship restaurant Tony’s. 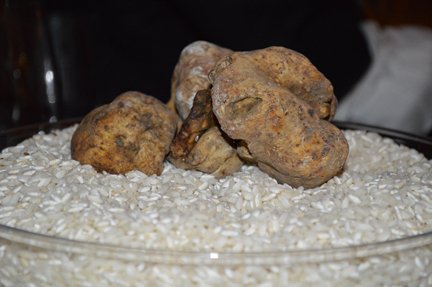 The rainy cold spring of 2013 and the late summer rains are indications of an excellent truffle harvest this year. 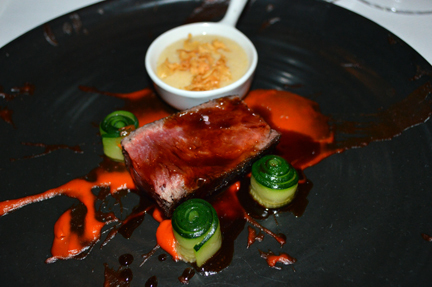 This dish was also spectacular: a slice of beef sirloin served al sangue over a tomato conserva with zucchine and “marrow” polenta topped with fried garlic chips. 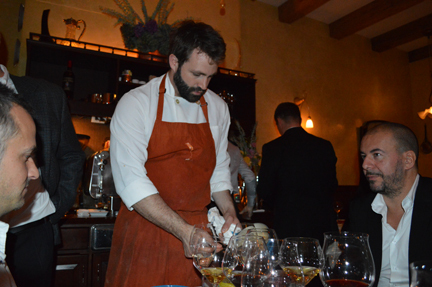 I loved the “action painting” mise en place. So much to be grateful for in this lifetime… Thank you, Tony.